The first multi-volume history of the American theater to have been published, The Cambridge History of American Theatre is an authoritative and wide-ranging history of American theater in all its dimensions. It recognizes changing styles of presentation and performance, and addresses the economic context that conditions the drama presented. Volume One brings together the work of ten major authorities on American theater and drama. 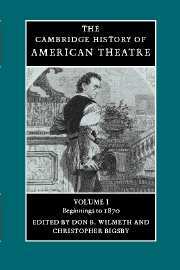 Like each of the three volumes, Volume One includes an extensive overview and timeline followed by chapters on specific aspects of American theater up to c. 1870. Introduction Christopher Bigsby and Don B. Wilmeth; Timeline: beginnings to 1870 compiled by Don B. Wilmeth and Jonathan Curley; 1. American theatre in context from the beginning to 1870 Bruce McConachie; 2. Structure and management in the American theatre from the beginning to 1870 Douglas McDermott; 3. The plays and playwrights: plays and playwrights to 1800 Peter A. Davis; Plays and playwrights: 1800–1865 Gary A. Richardson; 4. The actors: European actors and the star system in the American theatre, 1752–1870 Simon Williams; The emergence of the American actor Joseph Roach; 5. Scenography, stagecraft, and architecture in the American theatre, beginnings to 1870 Mary C. Henderson; 6. Paratheatricals and popular stage entertainment Peter G. Buckley.